Kermans Flooring in Indianapolis is giving away area rugs via their Monthly Area Rug Give-A-Way program. What?!? Yes, it is true and it is easy to be entered for a chance to win. 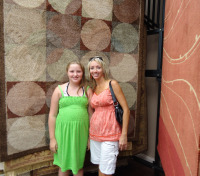 These lucky winners love their new area rug. Kermans Flooring is an Indianapolis carpet store located on 82nd Street, west of Allisonville Road (right off of 465). Kermans offers area rug cleaning and area rug repair services to Indianapolis and surrounding areas. View some of our area rug room scenes. What are you waiting for? Become a fan on Facebook, join the email list, and you may be our next winner!